The flowy mullet, the incredible eye make-up, the tight, tight pants. I am talking about my childhood dream hunk, David Bowie. I used to dance around the house, singing the theme song to his greatest movie at the top of my lungs. "Dance magic!" "Dance magic!" "Dance magic!" "Dance magic!!!" Chantel and Amber knew to run when they heard this. I took the lyrics as instructions, and liked to incorporate them into my dance moves. 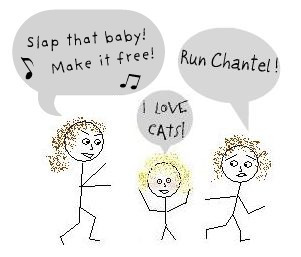 As Chantel mentioned in this post, my favorite babysitter introduced me to The Labyrinth at an early age. It was creepy and weird and strangely seductive. Everything a 6 year old could want in a movie. Since it's October, the perfect month for creepy movies, I am going to do a giveaway. Leave a comment telling me what you love/hate about this movie. Or maybe a memory about watching it. .....Well, ok. I'll give you some more options. For additional entries, follow me somewhere, or share this giveaway somehow. I'll leave those details up to you. If you are entering multiple times, be sure and leave separate comments for each entry. That way I won't miss any. This giveaway will end on Sunday, October 10, at midnight. And it's open to US residents only (not because I'm a hater, but because I will be using my amazon super saver shipping, and I want that part to be free). We have a winner! thank you all for participating, and for having such sophisticated taste in movies and music. Hmmm . . .I was about 10 when this movie came out, and I saw it a bunch of times. My brother hated it and made fun of me every time I watched it. 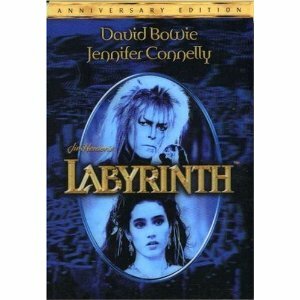 I loved The Labyrinth. It is one of my favorite movies. The first time I remember watching it I was around 5 or 6. I used to have Dreams/Nightmares (they weren’t scary at first but they scared me at the end) of being stuck in The Labyrinth. That is the one reoccurring dream I remember having and still have it to this day. Holy freaking cow! I never knew we had so much in common. Other than I was born many years before you...I love this movie. My sister and I break into that song all the time! I tried teaching it to Caleb but he just stares at me. Why did you ever move away? YAY! Love that movie... hence why my cat is named Sir Didymus. ;) The dog almost was Hoggle, but then my daughter pulled a fast one and named him Mushu. Can you guess where THAT came from? Do what? Remind me of the babe! I haven't actually seen it but my mom loves it so I'd love to win to watch with her! p.s. feel free to enter my giveaways!! I love this movie. David Bowie is the best, Jennifer Connelly comes next, and of course Hoggle and the bog of eternal stench. Lots of fun for kids and adults. The songs are really great and the muppets are fun too. I'm pretty sure it was this movie that's given me my lifelong crush on David Bowie (Seriously! Jareth's hot!) I saw Bowie in concert (finally) on his last tour and was so sad he didn't do As the World Falls Down. However, it's Magic Dance that I sometimes wind up singing randomly. I loved the effects in the movie. O.M.G. I LOVE this movie!!! It's probably my favorite movie. My husband makes fun of me every time I put it in, but I don't care because it's so awesome! I haven't seen this movie but I love creepy movies. without a computer for a couple of weeks I have missed reading your blog. I love the Labrynth movie. I admit when I was younger I got nightmares a lot and some of them stemmed from this movie, but I am so over it now :) Would love to win. I follow your blog and am glad I do! You are too funny. oh my gosh, oh my gosh!!! Best.movie.ever. I also saw this for the first time when I was young and continued to repeat, "you remind me of the babe... what babe?... the babe with the power... what power?... the power of voodoo... who do?... you do... do what?... remind me of the babe!" driving everyone in my house crazy. I LOVE the little worm "'ello!" and the scariest part by far was the junkyard scene when she thinks she's back in her bedroom and then the walls cave in... AH!!! Phew. ps. I also made a reference to this in a post I did about 2 year olds and makeup. and, um, yes. I follow you. What don't I love about this movie? My favorite part is Ludo, he reminds me of a dog I had. I was five when this movie came out, but I will admit I have never seen it. But what I do want to see if you with a mullet! Oh. My. Gosh. Labyrinth? Where do I even begin? I think I first saw it when I was 6 or 7. I remember running away into the hallway and hiding because I was so freaked out by those creepy muppets that took their heads off. I had nightmares for a couple years after that afraid they would would come out of my closet or from under my bed and try to take my head off. And for that reason, I won't let my 6-year-old watch it...yet. BUT... I really liked Luto. He's my favorite. To this day I randomly will say "Rocks friends" or "Smell BAAAAD!" Good times. never saw this movie. never. my parents were meaner than yours. honestly? i have never seen this movie. ever. but that's not a huge surprise since there are a lot of movies i have never seen. you should pick me so i can see it! LOL oh my gosh, David Bowie creeped me out so much in this movie! (especially the tight pants!) But it is a classic - we watched it all the time growing up! My favorite were all the weird looking muppets. P.S. - Thanks for joining my new "Terrifying Tuesday" blog hop on Cheapskate 4 Life! I am your newest follower. Have a wonderful day! Bowie did rock the mullet! I don't have a memory to share. I can't recall a darned thing about the movie to save my life. Maybe that is why I should win! Jennifer Connelly was well cast. Oh my! I remember when this movie came out. I grew up in England in the 70s and LURVED David Bowie. Still do. HE is the best part of the movie. Sigh. Ha--awesome! My best friend Ru is a huge Bowie fan and for years she would randomly yell "You remind me of the babe. Who? The babe with the power!" Even if we were walking down the hall at school. Good times. Love it! This movie was a huge part of my childhood. I loved it and watched the VHS hundreds of times. My daughter now loves it and we watch it about once a month...one of the best movies EVER. A bit of practical wisdom there. Labryinth is one of the best movies ever!! I just love Hoggle. I remember watching this as a child. I used to watch this and The Dark Crystal all the time! But I saw a kid with a mullet that's almost identical to that one the other day. It completely made my life. Oh, the thrills of living in the deep South. I would be in Bowie heaven to win this and be able to rewatch it whenever I like!! One of my favorite movies of all. BIIIIIIIGGGGGGG Bowie fan here, going all the way back to The Man Who Sold The World. Yep, that far back. I remember when Labyrinth came out. It was in the summer, extremely hot (kinda like this past summer ha!) and the air conditioning went out in my apartment. While they were fixing it, I went to the movies so I could at least stay cool. The matinee show was Labyrinth. I loved it SO MUCH that I sat through it TWO MORE TIMES before going home!! True story!! Do you think Labyrinth is where J.K. Rowling got "Hogwart"? I haven't seen this movie but my husband loved it so would like to try to win it for him. I remeber when I first seen this movie I was little and it scared me to death I remember snuggling up to my dad and him telling me that it was ok it's just a movie but I've now grown to love it and it always reminds me of my dad. when I was in my teens my mom would talk about this movie that would completely creep me out. The things she would say just seemed so strange ... until ... we found it!!! Labyrinth was that movie that she talked about. You'd said that it came out in 1986 when you were 1 yet you had not seen it til' you were 5... Well I was born in 1988, and hadn't seen it til' I was 16 I think. That is so funny, I always try to talk with my hands and quote "She chose down" and no one ever gets it! I also try to say "Smell Bad" in the same way but it either doesn't sound the same or others just don't understand! I haven't seen it for a very long time! 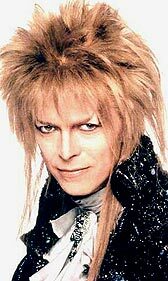 I used to watch Labyrinth a lot as a kid because it was always on TV and I remember trying to tell my parents how David Bowie is in it, after David Bowie was shown on tv for something else, and they were like no no no, he is a singer he is not an actor and being very frustrated because I knew it was him! I love all the creatures in the movie! i love everything about this movie! i like the creepy hands..."Yes, which way?! She chose down....she chose down!!" Lol. I couldn't ask for a better give away! I ADORE THIS MOVIE!!! My mom and sister do as well. :) My favorite scene is with the purple worm. Worm "'allo" Sarah "Did you just say hello?" worm "No I said 'allo, but that's close enough." LOL. I would love to have this movie for when I have my baby! (In a few months) :D Thanks! When the movie came out I was the mother of 2 preschoolers. Yikes! How did that happen. Anyway, my kiddos loved this movie. My older daughter would say "Goblin King, Goblin King" and the younger one would run and hide saying "Don't take me, Goblin King!" Now I would love to give the movie to my grand daughters. I'm sure they will love it as much as their mothers' did, way back when. The best thing about this movie is Bowie. "As the World Falls Down"-wow! I hate this movie, but my partner loves it...I don't know why! I actually haven't seen this movie, but I would love to, thanks for the chance! I love everything about this movie. It is one of my favorites, filled with imagination, wonderful amazing puppets, and wildly creative places like the Bog of Eternal Stench and the Goblin City. Jim Henson, your death was such a tragic loss to the world. I often wonder how many other treasures like Labyrinth and The Dark Crystal he might have given us had his life not been cut so tragically short. 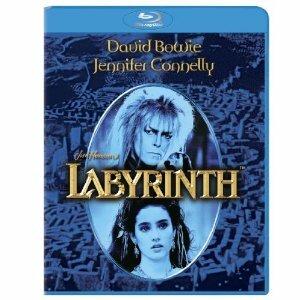 I already own Labyrinth on DVD, but would LOVE to see this film on Blu-ray! Thank you for the chance to win. I just remember David Bowie being awesome! I love hating this movie - I would like to pair it with Grease 2 on a double feature night. My favorite was the worm on the wall who was always asking "How bout a cup of tea"
I loved the characters in this movie and when they would break into musical numbers. It is such a great fantasy. I subscribe via email (I hope that counts as following). This is absolutely one of our favorites! It was always my daughter's favorite. It was a lot like her favorite book growing up "Outside Over There" by Maurice Sendak. "You remind me of the babe...."
It has the presence of Bowie! I was in my twenties when this movie came out and I still loved it. And I think that;s my favorite part of it, it transcends age. It was always kind of provocative, I thought, this older being (Bowie) having a thing for and underage girl. Fantasy or not that was pretty steamy. And even though I'm not a Bowie fan, I thought he played the part well. I was 16 when the movie came out and was an instant fan. Love, love, love David Bowie!!! I made both my kids watch the movie too. My daughter fell in love with the Goblin King, while my son and husband both think I'm off my rocker. My sister and I used to watch this when we were kids..we loved it! Thank you for the giveaway. I remember watching this movie multiple times, we even owned it when it first came out. I'll be completely honest though. I've been talking about getting this movie because, I loved it. I just don't really remember anything except those tight pants, LOL. I used to watch this over and over again with my cousin when we were kids. We still sing the 'you remind me of the babe' song when we're together for laughs. That's my fave part of this movie! We love this because David Bowie totally rocks it. I have never seen this movie but David Bowie is always intriguing to watch and Jennifer Connelly is such a fine actress, that I would like this DVD. I remember watching it when I was younger,loved it and of course david bowie rocked! I love this movie, have seen it quite a few times. Let my niece and newphew watch it and they thought it was so funny. I follow on twitter as jlj516. I just love that David Bowie is in it. I am embarrassed, but I have not seen this movie. I would love to though! I shared this giveaway on facebook, I love how you said he had the Best.Mullet.Ever. lol! I remember being afraid of this movie. I remember there were muppets of some kind in it. I remember loving this film as a kid, especially because I was drawn to Jennifer Connelly's dark beauty and mystique, but what's funny is that my memory of Labyrinth's intertwined with another Jennifer Connelly fantasy film I saw the same year, "Phenomena" (which I think had the title of "Creepers" when it was released), so my brain has mixed up the two to the point that I have a razor-wielding monkey attacking David Bowie. :) Needless to say, I need to see this movie again, and it would be awesome to do so on blu-ray. Thanks a lot! I was in college when the movie came out. I really like a lot of the imagery and costumes. I remember seeing a couple who did a gorgeous reproduction of David Bowie's and Jennifer Connelly's costumes for a convention in 1986 or '88. I'm pretty sure I have the soundtrack on vinyl somewhere around here, too. I'd love to have the DVD. The first time I saw this movie, it gave me nightmares. It was worse than Alice and Wonderland.